If you own a fish pond, you already know that a significant amount of maintenance is required in order to keep the water clean and the fish healthy. On occasion, you may need to remove some or all of the fish from your pond so you can make repairs, improve the water quality or reduce the number of fish living in the pond. A net is a useful tool if you want to remove only a couple of fish, or one specific fish, from your pond. A long-handled net will enable you to scoop the desired fish out of the water without harming them. Make sure the holes in your net are small enough that the fish cannot slip through the holes. If you need to catch a lot of fish, use a large net or seine that you place in the water and drag through the pond, capturing many fish at once. You do not have to drain the pond to use a seine, but it is easier to use a seine if you have drained an amount of water out of the pond. If you partially empty the water from the pond, all the fish will be forced into a smaller area of the pond and will be easier to seine out. You can use traditional fishing as a method for taking a few fish out of your pond, if you are so inclined to do so. Some individuals may choose to attempt to catch fish by hand. The process of catching catfish by hand is called "noodling" and is a popular sport in some areas of the country. Your fish can easily become stressed when they are caught and removed from the pond that is their home.The longer your fish are out of water, the more likely they are to suffer health consequences as a result. 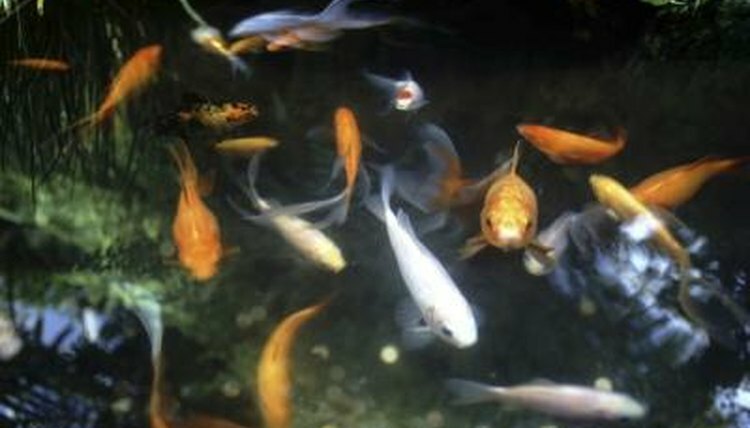 Before you start removing fish from your pond, you need to fill a holding container with water from your pond. The holding container should be ready and waiting for your fish to go into when you lift them out of the water. You want to be gentle and careful when you are catching your fish. Do not smash, crush or otherwise mistreat your fish as you lift them out of the pond water to place them in the holding area you have prepared for them. Make sure your holding area is aerated properly so your fish will have plenty of oxygen in the water. Do not leave your fish in the holding area any longer than necessary. Missouri Department of Conservation: Why "No" to Noodling? Is There Any Natural Way to Dechlorinate Water for a Fish Tank? What Should I Do With a Koi Pond in the Winter?